Are you thinking of innovating with an ice rink but are not sure if your investment will be profitable? When making an important investment, you should not worry if it is not profitable at the beginning. It requires patience and a good strategic long term plan. Below are a few ideas on how to make sure you will obtain revenue and it will be profitable. Selling ice skating tickets. This is the first idea that comes to mind in terms of recovering investment when we decide to open an ice rink. You can sell tickets per minutes, days or season. Selling monthly tickets guarantees revenue throughout the whole season and more people. Merchandising products. Skating fans could be interested in purchasing t-shirts with the ice rink logo, customized water bottles, gloves, scarfes, hats and many more products that are related to ice skating and leisure. It is another way of generating revenue. Food and beverages sales. Set up a bar next to the ice rink. Many parents like having something to drink while their kids skate or even have something to eat after skating. It is a great way to increase profits and patrons love it. Ice hockey tournaments. Besides having the rink open to the general public or members, why not organize tournaments to encourage sports amongst the youngest ones. This generates expectation and public gathering around to watch. Curling competitions. As ice hockey is, another comun sport is curling. It is common in bowling alleys as groups of friends can spend evenings together playing while they relax with a beer. Good times are guaranteed! Skating lessons. Either it´s figure skating, ice hockey or just skating. A great after school activity for kids that want to play sports. Click on this link to get to know the benefits of skating for kids. Private event celebrations. Offer your ice rink to host events, birthdays and other parties. Kids love it! Advertisement on barriers. The Xtraice barriers are transparent therefore they allow visibility. You can choose in all or just some, advertisement vinyls of other businesses for a monthly fee. If your rink gathers crowds, different companies will not take long to advertise themselves. It is a fast way to recover part in your investment. Renting out the ice rink for private events. If you need to increase your revenue during certain months of the year, why not rent your rink to other companies for events? Product presentations, team building activities are some of the thousands of options. 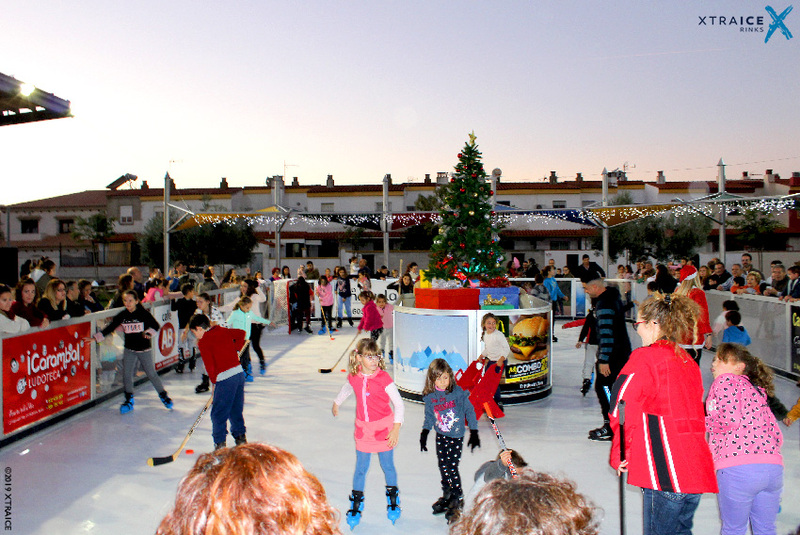 Renting the rink to municipalities or shopping malls during the Christmas season. Thanks to the easy maintenance, installation and lack of energy and water bills, Xtraice rinks are a great asset for public organizations and company communities. Do you need specialized assistance for your project? Fill out this form clicking on this link and our project development team will contact you shortly.